We have in the past been occasionally successful in purchasing batches of the original RHP QJM 1 3/8 split inner track crankshaft bearings. Sources have been quickly drying up unless the enthusiast wishes to pay in the region of £200 plus VAT on the basis of desperate need. We have however, once again been successful in purchasing a further quantity of the RM DMJT 1 3/8 split inner track bearings. These are generally referred to as 'location bearings' and are 5 tho undersize on the external diameter of the outer race, otherwise they are, in all other respects, of identical specification to the RHP QJM equivalent bearing. It therefore, seemed common sense to outsource to a specialist company who have hard chromed then precision ground to the correct QJM outer bearing diameter to provide the correct specification bearing for our cars. Hard chroming of high alloy steel components is an all too common every day practice within the British aviation industry and we confirm that our bearings are fully prepped by a specialist sub-contracting company who undertake this aviation quality work. This process includes normalising debrittlement treatment and we fully guarantee the performance of this bearing. We have adopted a practical common sense approach, with no compromise whatsoever in order to supply a cost effective identical product. The QJM 1 3/8 does not offer anything more as they are effectively the same bearing. The photograph on the right above shows a QJM 1 3/8th and a DMJT 1 3/8 bearing. Both have identical bearing specification and one is hard chromed and professionally precision ground, but which one? The answer - we don't really know either although one of them is around £85 cheaper than a VAT inclusive price being offered elsewhere. A word of warning: We are aware that MMM enthusiasts are also being offered a Chinese copy RHP QJM bearing which is sometimes retailed in an unbranded blue box. We were curious as to the origin and through months of investigations, we tracked these down to a source in China. Having spoken to the Chinese on this product, the bearing is not all that it would appear to be. 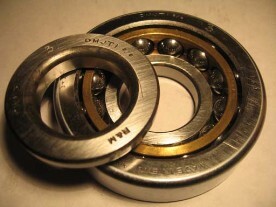 Firstly, there is one less ball bearing incorporated within the race (i.e. 11 balls instead of 12) and secondly, we ascertained that the material specification compared to the original is rather substandard. For this source to make bearings to the correct specification the cost would be astronomic. We have learned that this substandard bearing is being offered to the MMM enthusiast. These can be use in conjunction with the crankshaft bearing retaining plate we stock.